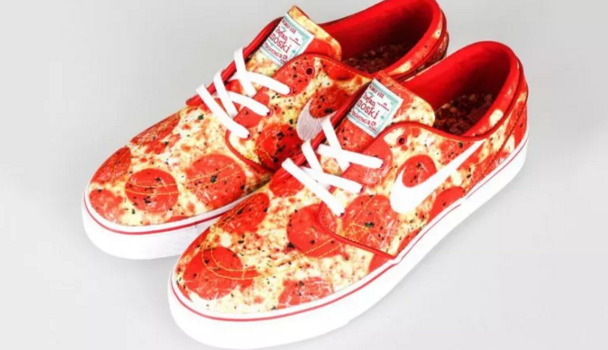 Nike has released a pair of sneaks that is reminiscent of Vans' Late Night collection, with our favorite food as the print: pizza. Pizza and other foods such as tacos have been fairly popular in fashion (because why not) and we are loving it. Nike's design is dedicated to the best topping, pepperoni, and is a collaboration with Skate Mental. Earlier this year, Nike released the "Waffle Dunk" and the "Cold Pizza Dunk" so food themed kicks are nothing new for them but this is a whole new level. There is no confirmed release date for the shoes but we will keep you updated when we find out! Grab some 'za for lunch in the mean time.